Despite protests from the Presidential Human Rights council, the Upper House approved a bill that would dramatically increase fines for those accused of participating in illegal rallies. 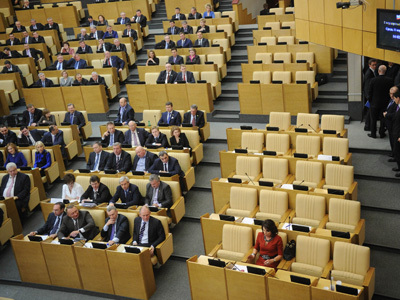 The Federation Council approved the bill with 132 votes for and just one against with one abstention. The new law raises the maximum fine for ordinary citizens found guilty of participating in illegal street protest to 300,000 rubles (about $9,000) from the current 2,000 rubles (under $70). 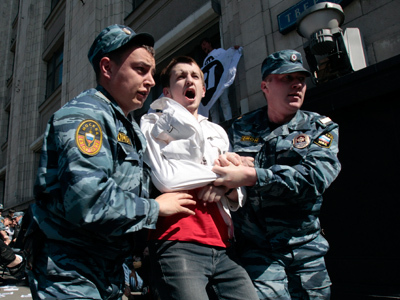 Meanwhile, the fine for officials will increase from the current 50,000 to 600,000 rubles ($1300 – $20,000).The bill allows individuals the option of performing up to 200 hours of compulsory community service instead of paying the penalty, which may prove exorbitant for some protesters. The discussion on the bill in the Upper House was relatively short compared to the tense standoff that occurred in the Duma the previous day. Then, the parliamentary opposition, composed of Fair Russia and the Communists, attempted to prevent majority party United Russia from moving forward on the bill by submitting excessive amount of additional amendments, each of which had to be read aloud and voted for. 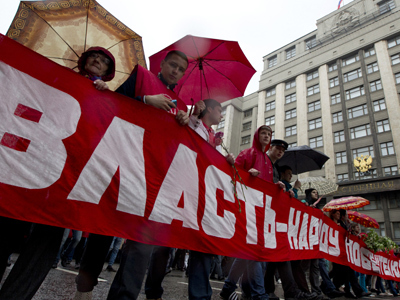 The opposition hoped this filibustering tactic would buy them some time for those who plan protest action on June 12, which is the ‘Day of Russia’ holiday. United Russia, however, replied by rejecting the amendments categorically. Nevertheless, the session continued until almost midnight, with the bill eventually passing the Lower House. Russia’s political opposition launched a protest near the Upper House as the bill was being considered, claiming that the new regulations opened way to “a fascist society.” The demonstration ended calmly, unlike the previous day when the protests resulted in brief detentions. The only senator who objected to passing the bill was Lyudmila Narusova of the Bryansk Region. She said that the Upper House was showing excessive haste with the document. “As we know, the State Duma passed this bill only yesterday and today we are already holding hearings. In the past, as I recall, we have demonstrated such haste only once, when we decided to send in troops,” Narusova said, apparently referring to the 2008 decision to render military aid to South Ossetia as it fell victim to Georgian aggression. “We have not even received the text of this bill in hard copies. Why such rush?” the senator asked her colleagues. She also added that “passing such hasty decision without any discussion” would negatively affect the reputation of the Federation Council. The Upper House chairwoman Valentina Matviyenko asked Narusova not to use unnecessary excitement and insults in her speech and noted that Narusova had had an opportunity to study the bill if she were really interested. The Federation Council then dismissed the plea and held a hearing, but Narusova did not vote. Meanwhile, the Presidential Council for Human Rights has come out against increasing fines for illegal protests. Mikhail Fedotov, the council head, sent a written request to the speaker of the Upper House, Valentina Matvienko, to reject the bill (the press service of the Upper House has said it has not received any such letter). Fedotov said that the council would study the draft law as it made its way through parliament, promising to ask President Putin to veto the document if the HR activists disapproved of it. The head of the Moscow Helsinki Group, veteran Human Rights activist Lyudmila Alekseyeva, also told reporters that she would ask Putin to veto the bill. Meanwhile, Dmitry Peskov, Vladimir Putin’s press secretary, has said that the president can veto the bill, but only if it differs from similar laws in various foreign countries. “Putin will object to the bill only in one case – if this bill is in contradiction to the generally accepted practices that are being performed in other countries in order to ensure the rights of the citizens,” he said. In Germany and France, for example, participating in illegal rallies and refusing to comply with a police order to disperse carries a maximum sentence of 1 year in prison or up to 15,000 euro in fines (just under $1,900). In the UK, meanwhile, those arrested for violent behavior at street protests can be sentenced to 5 years in prison with an additional fine of up to 2,000 pounds (over $3,000). In the US, participants of an unsanctioned rally can be fined up to $3,000 if they obstruct traffic; in the event that a protester is found to be carrying a weapon, or anything that could be used as a weapon, the individual could face up to 10 years in prison. Putin's press secretary also added that the president would study the bill only after he receives it for signing.